Here Comes The Sun-Powered Energy! It's Cyber Funday on Wow in the World, and Mindy is taking full advantage of all the good deals! Sales on everything thing she's ever wanted and everything she never even knew she wanted! But is her online shopping spree a good deal for the planet? Guy Raz takes Mindy on a little time traveling fossil-fueled trip to the past to see how we can best protect the Earth for the future! It's the Who, What, When, Where, Why, How and Wow in the World of Fossil Fuels and the future health of planet Earth! Imagine a giant asteroid is out in space and headed on a collision course with planet Earth. Your mission, is to annihilate this giant mass of space rock before it can even get close. What do you do? How do you do it? Join Mindy and Guy Raz as they travel through time and space to the asteroid belt for a little experiment of their own! It's the Who, What, When, Where, Why, How, and Wow in the World of Planetary Defense! You might think that rice krispies belong in the kitchen, but as Guy Raz and Mindy find out at the Annual Nom Nom Foodie Awards, they also belong on the big screen and in the lab! Join Mindy and Guy Raz as they discover what the average bowl of cereal can tell us about the structural integrity of antarctic ice shelves! What do humans, bottlenose dolphins, and the singing mice of the Costa Rican cloud forests have in common? Well according to a new scientific study, we all share the power of singing...in duets! But why?! And how?! Join Mindy, Guy Raz, and Reggie, as they visit these singing mice on their live concert tour, and witness this vocal turn taking with their eyes and ears! It's the Who, What, When, Where, Why, How and Wow in the World of Singing Mice and the brains behind musical conversation! If you could take one item to a desert island what would it be? A pacifier? A rattle? How about a diaper? Well that might be just what you need if you're visiting an itty bitty baby island! 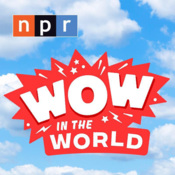 Join Mindy and Guy Raz as they take the Wow Machine out to the middle of the Pacific Ocean to visit the youngest volcanic island on the planet! It's the Who, What, When, Where, Why, How, and Wow in the World of VOLCANIC ISLANDS!